. : Optics & Photonics Focus :: Twisting the Knob of Light :. We usually think of the north and south magnetic poles as an inseparable couple. Experiments have now shown that under the appropriate conditions they can, in fact, break up. Superheroes, watch out! A new rival, such as you have never come up against before, is in town. Progress is the name! And the exclusivity of your superpowers may well be at stake. Thinking at the speed of light may soon acquire new meaning — inspired by how the brain processes information, researchers present an optical system capable of recognizing spoken words. Tuning nano-antennas may soon become as simple as tuning a radio to our favorite station — this is the new promise of nano-photonics. An example of optical nanocircuit. 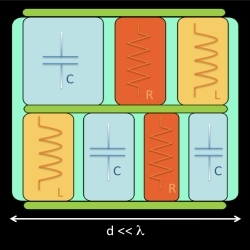 Several nanostructures arranged next to each other at the nanoscale could become the present electronic circuits, allowing to rescale down radio-frequencies concepts such as the one of resistance (R), capacitance (C) and inductance (L). Good things come in small packages: in the general trend towards miniaturization, our ancestors’ wisdom seems to be the leitmotif of modern technology. In fact, scientists today are scaling down everyday concepts. Following a new theoretical proposal from Andrea Alù and Nader Engheta at the University of Pennsylvania (USA), tuning the response of something as complex as an optical nano-antenna may soon become as simple as tuning into our favorite radio stations by the mere twisting of a knob. Nowadays, antennas are all around us: antennas for radio and television broadcasting; antennas for cell-phones; antennas for space exploration. They convert electromagnetic radiation propagating in free space into electrical currents and vice versa. Antennas therefore play a key role in bridging the gap between electromagnetism and electronics. All of the antennas surrounding us are built for electromagnetic waves ranging from a few centimeters — in wireless networking — to a few kilometers — in AM radio broadcasting. So why build antennas for the much shorter — a few hundred nanometers — wavelengths of visible light? The reason is simple: optical nano-antennas could one day connect light to future optical nano-circuits, just as current antennas can match radiowaves to electronics. "Optical nano-circuits and nano-devices can play a very important role in the future of science and technology," Engheta explains. "By bringing down the scales of the circuits to the nanometer scale, one will be able to achieve remarkable miniaturization. By using optics in nano-circuits and nano-devices, instead of conventional electronics, one would be able to increase the bandwidth of operation, which in turn would provide a higher data rate and significantly larger data storage." Typically, an antenna of a specific length is at resonance with a certain wavelength of light. Consequently, in order to tune the resonance to a different wavelength, the most straightforward way would be to physically lengthen or shorten the antenna. Think, for example, of the telescopic antennas of old televisions and radios; the length of the antenna could be altered manually in order to obtain better reception. Still, one of the most successful features of antennas at radiofrequencies is the possibility of transmitting and receiving at several different frequencies without physically altering the antenna itself. Indeed, it is possible to change the effective length of the antenna without changing its physical length by using an appropriate electronic circuit made of lumped elements, such as resistors, inductors, and capacitors. Although sounding rather complicated, in reality, this is simply what happens when twisting the knob of a radio. Is it possible for optical nano-antennas to also be tuned? Even though conceiving the notion of telescopic nano-natennas is highly probable, it may very well be that adjusting the length of an object smaller than a bacterium is not very feasible or practical. Unfortunately, conventional lumped elements do not exist in the optical regime because conventional materials have completely unconventional properties at light wavelengths. For example, metals, of which antennas are usually made, are not conductors of electricity. Nevertheless, there is loophole: lumped nano-elements, although non-existent in nature, can be appositely designed. "While in microelectronics, the basic ‘alphabet’ of a system is usually made of lumped elements," Engheta explains, "in the field of nano-optics, the basic elements have so far been considered to be waveguides, lenses, gratings, diffractive elements, to name a few. In my group, we have pioneered a new circuit paradigm by demonstrating analytically and computationally that material nano-particles, when designed properly, can indeed act as lumped nano-elements." Hence, such lumped nano-elements can be used to tune, with large flexibility, the infrared and optical responses of nano-antennas, just like common lumped elements are utilized to tune the responses of radiofrequency antennas. According to Roberto Merlin of University of Michingan (USA), "sophisticated nanofabrication is the main challenge for the construction of optical nano-devices. Since nanolithography and nanofabrication are developing at a rapid pace, it is likely that some of the challenges and limitations will be overcome in the near future." Engheta agrees that "one of the main challenges is in the nanofabrication of such nanostructures for real applications. There are promising directions available for us; I am hopeful that in the near future some of these challenges will be overcome." Once such technological limitations are surmounted, communications, data storage, medicine, and various other fields could ultimately benefit from these types of devices. Engheta foresees that "such optical nano-antennas will be useful in molecular spectroscopy, in which one would be able to design proper sets of nano-antennas coupling two or more molecules optically. This, in turn, could provide us with a whole new paradigm in sensing and spectroscopy of molecular fluorescence. Another interesting futuristic application will be in optical wireless communications in the nano and micrometer scales. Imagine that one day we will be able to send and receive signals in a micro-scale domain using such optical nano-antennas." Furthermore, Merlin confirms that "optical nano-devices such as nano-antennas may also play a role in information processing. Since these devices operate with local optical fields (instead of electrons) they may have a much higher bandwidth, possibly leading to faster information processing (faster rate and denser data storage.) The approach pursued by Engheta's group represents a new way of looking at the field of nano-optics, which may facilitate the design of new nano-devices and nano-components. The tunable optical nano-antenna is just one example of such a device. The areas that come to mind when considering applications are biosensing, nanolithography, and nanoscale microscopy. A nano-antenna can alter and manipulate molecular emission and absorption. Another set of applications could perhaps be wireless communication at the nano-scale level using optical signals. This is evident as such in the case of the tunable nano-antenna." Andrea Alú and Nader Engheta, Tuning the scattering response of optical nanoantennas with nanocircuits loads, Nature Photonics (2008) 2, 307-310 (link). Andrea Alú and Nader Engheta, Input Impedance, Nanocircuit Loading, and Radiation Tuning of Optical Nanoantennas, Physical Review Letters (2008) 101, 043901 (link).